When colorful livestock, dancing tractors, diving dogs, woodcarvers, a Dixie Band and racing pigs are part of a grand assembly, it can only mean the county fair is in town. Driving up to Rhinebeck, NY for the annual Dutchess County Fair, we couldn't have asked for better weather to enjoy this American tradition. 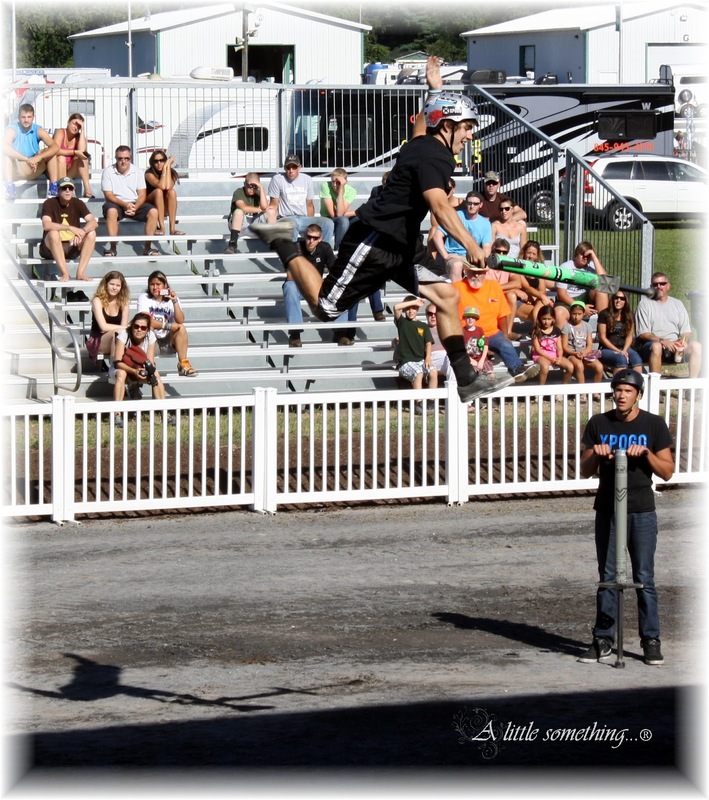 A nice breeze, lots of sunshine and a sea of people covered the Fairgrounds. This was a first for us, and we were not disappointed! Though so cliche, there was something for everyone here, whether you love food, unusual attractions, animals, arts & crafts, or music. Walking the whole day (almost eight hours) from one area to the next, we made sure not to miss any of the fun. Brenna and I had a personality analysis of our handwriting, Robert pet a chicken, and we were raised to new heights on the Ferris wheel. Brenna flew around the sky on the reminiscent ornate swings. 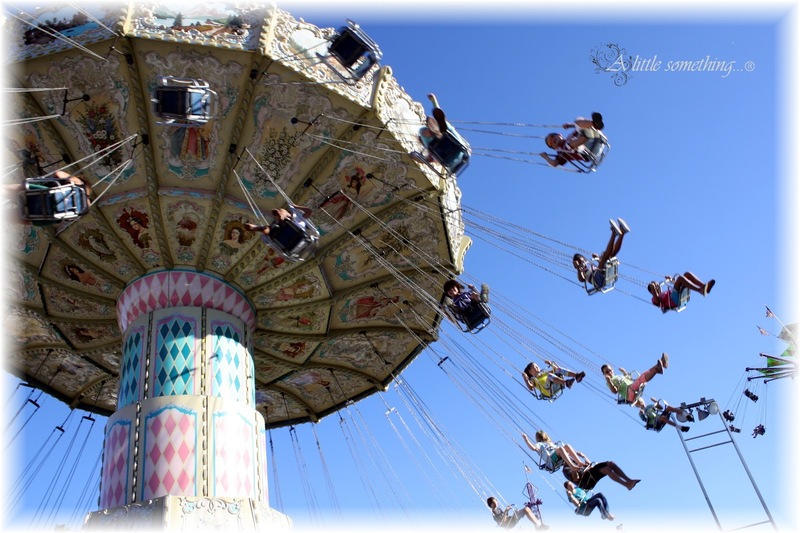 There were many rides for all types from the daredevil to the docile, with a whole section in Kiddie Land suited for little children to enjoy. Engrossed with the retrospective Century Museum Antique Village, we browsed vignettes moderated by volunteer docents ready to answer questions about everyday life in 1913. The auto front and center set the mood as we entered. Time stood still as we watched the craftsmen working in each setting. Chair caning was a popular craft at the time and required much patience and diligence. Each seat had a thread of cane woven vertical, horizontal and two diagonal for ultimate seat support. That's tedious work! There were some canned and packaged goods in the country store still on the shelves today - we spotted Jello! Here, the docent demonstrated various knitting techniques used which was a great way to incorporate the wool buzzed off in the Sheep Pavilion. Out on the Texas Roadhouse Grandstand, these were the Dancing Diggers. 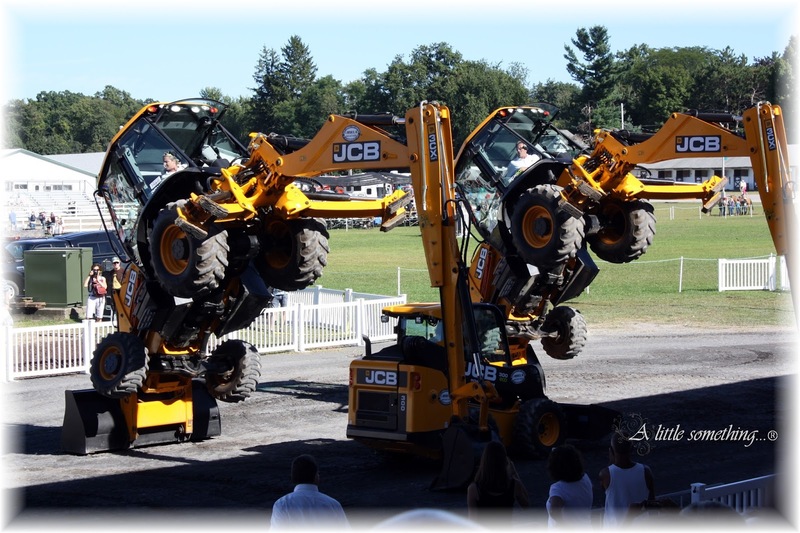 Now, we never saw power tractors maneuvered like this before! And choreographed to music! You can check out their YouTube video. 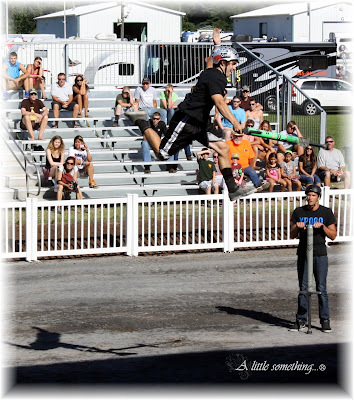 After the power display, the XPOGO Stunt Team jumped into their own high-powered show of stamina on super hydrolic pogo sticks, flipping in the air, swinging around in stunts that seemed effortless. It was quite a show! Lots of the animals were allowed to be pet and even fed. They were gentle and calm, as long as you handled them with care. We saw goats, sheep, cows, horses, pigs and even llamas. Much beauty to behold in the number of different color and pattern feather variations of the chickens. In the Horticulture building, numerous winning floral and landscape displays encompassed a variety of themes, like this replicated Kingston Rhinecliff Bridge of lights and winter greenery. A hand-carved wood bench with detailed owl family perched here - one of the many crafts on display for sale putting artisans in the spotlight. Robert was absolutely right when he said once we returned to the hotel, we wouldn't want to leave. So we changed into pj's, ordered for local pizza delivery, and called it a night. What to do Sunday? Another gorgeous day earned us a chance to drive to Hyde Park for more American heritage, this time to the homestead Springwood, residence of President Franklin Delano Roosevelt. Our guide, Victor, was very knowledgeable about FDR's life history, with anecdotes about his character and enlightening personal traits as President and man of the times. This bronze statue embodies Eleanor and Franklin in a jovial moment as you enter the Henry A. Wallace Visitor and Education Center. The cafe offers a tasty menu of light luncheon items we enjoyed out on the terrace. Laid all in mosaic, this map is centrally located on the floor of the Education building. All the domiciles of the Springwood estate are pictured on this vast work of art for all visitors to admire. Young FDR in bronze sits in the main hall, majestically greeting us as we enter his home. The library where Roosevelt spent much time. Throughout the house are personal artifacts, many hand-made pieces adding to the intimate surroundings. In the garden, the floral color display was rich, even at the end of August, with the carriage house in the distance. Franklin and Eleanor are both buried on the grounds, a request to return home once the time came. 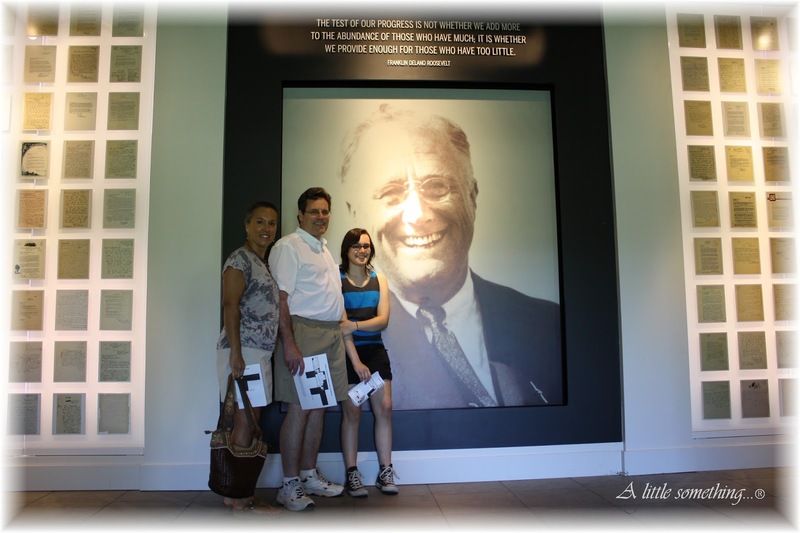 We visited the Presidential Library where the displays take you through FDR's presidency, the lives of the Roosevelts, the Great Depression, the New Deal and World War II. Though I am not a big fan of history, the library's interactive exhibits made the learning journey fun, filled with personal memorabilia and authentic audio and visual components, encouraging you to look, listen and learn. Brenna listened to Roosevelt speak to the nation in one of his many fireside chats here in the Map Room over the rotary phone. His desk is behind glass, all in tact as if he were about to re-enter and get back to work. Around, the glass walls are etched with the Four Freedoms he articulated for us as a nation. Surrounded by the items most dear to him, Roosevelt believed, "the dedication of a library is in itself an act of faith... A nation must believe, in the capacity of its own people, to learn from the past that they can gain in judgement in creating their own future." This presidential library, belonging to the people, is an attestation of how modern technology combined with antique replicas, like these actual letters to FDR concisely displayed around the center video screen, can creatively and efficiently archive a life, an era, American history. 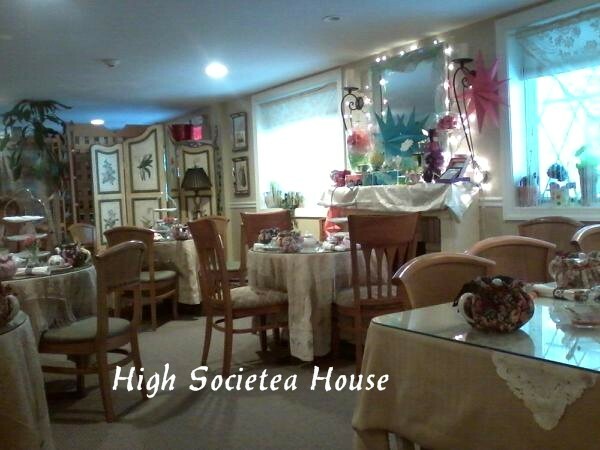 Our travels continue to take us along the high tea road! And I have so much more to share with you! Going with the flow, allow me to pour part two of Summer Sips - a first hand look at the 'Downton Abbey' experience of taking the ritual of afternoon tea at some of New Jersey's tea (and this time, coffee) establishments. Between the beverages and banquets, Brenna and I have certainly gotten a taste for some quiet time, a new habit adopted to quell the stresses of the everyday. While listed as a tea room, Victoria's in Teaneck is actually more of a luncheon place tucked into Queen Anne Road. Here, they serve afternoon tea daily from 3-6 pm, so Brenna and I decided to give it a try. I drove by the first time, missing the parking lot, but simply went around the block successful the second time around. We were the only ones in the tiny place, feeling really comfortable seated by the window overlooking the courtyard in back. 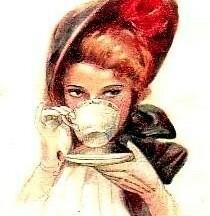 Since only there for tea, we simply glanced at the dessert menu and our waiter listed the simple teas offered. While their limited tea selection was disappointing, the sweet options certainly made up for it! Brenna ordered the tiramisu and I had a crispy apple pillow paired with vanilla ice cream. Both dolloped with fresh whipped cream, they were absolutely delicious! We decided to most definitely visit again, only next time a bit earlier to include lunch as well. 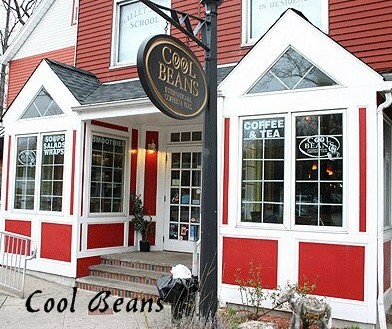 The next place we tried is a trendy spot on Kinderkamack Road in Oradell, called Cool Beans. Often passing on our way back and forth in Bergen, this is a place we've been eager to sample since it really looks, well, cool, and being that both Brenna and I love coffee, it is a no-brainer. What I had found out was that they not only have a great selection of coffees, but a tremendous selection of international teas, as well as smoothies and a variety of other blended drinks. So one afternoon, after perusing a couple of area shops, we popped in for lunch. We were pleasantly surprised. It is easy to see why so many people meet here for local live entertainment, Java Date and Open Mic Nights. After the casual vibe draws you in, select from their easy blackboard menu of salads and sandwiches, and you can't help but linger and relax. Brenna and I both ordered the daily chicken foccacia sandwich special, and found a table in one of the front windows so we could watch the passers-by. Okay, so we took a break from tea and ordered iced lattes - it was a hot, hot day! While up at the counter ordering our lunch, we couldn't help but eye the dessert case and vowed to try something no matter how stuffed we got. So we ordered the key lime pie and chocolate layer cake, both HUGE pieces we wound up taking home to finish. Oh, we'll be back again, next time to try some tea. 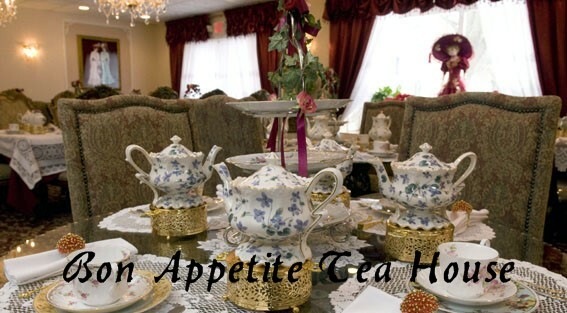 From easy to elegant, our road trip took us to Mahwah, where we entered the posh decorated Bon Appetit Tea House on Franklin Turnpike. The website stated the hours were Wednesday through Sunday, 11 am until 4 pm, so we dropped in at 1:30 pm in hopes of enjoying high tea as a Wednesday afternoon treat. We were greeted by the owner and asked if we had a reservation as we stood in the completely empty tea room. Surprised to learn that there was a special 2 pm seating of a fixed price High Tea with 'complementary' massage included, we hesitated at first, but decided to stay and were seated at the only table for two near the window. Now this event was not mentioned anywhere on the website, and honestly, Brenna and I didn't feel completely welcome. This place was the most costly one we have visited by far, and while the tea room is decorated rich and beautifully, it lacked the comfy, welcome feeling we experienced up until now, emphasized by the uppity attitude of the owner. It was a shame, because the food was very good - the spinach quiche was really outstanding, as a light, melt-in-your-mouth perfection. But the tea was served in china pots over bright gold votive candle warmers and we were told that the candles must be extinguished once we finished the tea as not to crack the pots. After our shoulder massages, we eased up a bit, but the inadequacy returned as we nibbled on the finger sandwiches and sweets. Of course, we wouldn't like to be rushed, but we experienced the opposite here - we waited almost forty five minutes for the check, finally flagging the only waitress down and then had to wait longer for the owner to bring it. Well, I guess when you visit so many different establishments you are bound to run into one you are sure not to visit again. C'est la vie! But I am happy to say our travels end with a very pleasant note... Just a half hour from home is the High Societea House in Wayne. I called earlier, messaging to make a reservation, and was confirmed by Bernadette, the owner, promptly before we hit the road. What a delightful place! The minute you walk in, the gift shop area is filled with an array of carefully selected tea-themed items - everything from their signature teas to beautifully crafted tea pot sets and books. We were seated at a quaint table dressed with fringed crochet and brought three special teas of the day to sniff in addition to the extensive house menu. Even though Brenna and I already ate lunch a couple hours prior, we each opted for the Queen's Tea, a six-course offering of soup, quiche, scones, finger sandwiches, assorted sweets and a plated dessert. Brenna's tea selection, Tibetan Tiger, was a smooth and flavorful blend of caramel, chocolate, butterscotch, and vanilla, all of which came through for an exotic taste experience. I opted for one of the specials, a white tea blended with passion fruit and pear, another sensory sip. The tomato-basil soup and asparagus Swiss quiche were savory, and the red, white and blue scones hit the spot. We were so filled with the generous portions of hot and cold finger sandwiches, we took the key lime pie slices home to satisfy the craving should one arise later in the evening. Grandma loved macaroons. I remember the first time I picked up one of her sticky toasted confections. The smell was exotic and sweet as I took a big nibble. The texture was unlike anything I ever had before, and I gobbled the whole thing in a couple of bites. That was it, I was hooked, beginning my extreme attraction to coconut. 2) Whisk together well and put in refrigerator until chilled, about 15 minutes. 3) Pour and freeze mixture in an ice-cream maker. 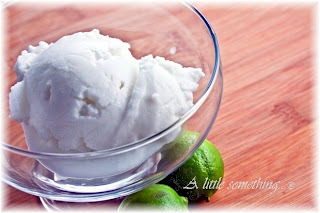 Transfer sorbet to an airtight container and put in freezer to harden. ENJOY! Want to impress you summertime dinner guests? For an added delight, why not scoop some sorbet into waffle cones propped in champagne glasses? Summer flavor can easily hop from refreshing to refined with a bit of creativity in the presentation, becoming a real sensory experience of different textures.